The Minister of State for Youth Affairs and Sports (I/C) and Information & Broadcasting, Col. Rajyavardhan Singh Rathore addressing the gathering at the Closing Ceremony of the 22nd National Youth Festival, at Gautam Buddha University, in Greater Noida, Uttar Pradesh on January 16, 2018. New Delhi: The Khelo India Anthem, which was unveiled on 15th January, has already struck a chord with India. The anthem has crossed an unprecedented reach of 200m reach across digital platforms YouTube, Facebook, Twitter and Instagram. It has struck a chord with celebrities and politicians alike. Right from Sachin Tendulkar to Amitabh Bachchan, everyone took to their social media channels and praised the effort that has gone behind revamping this program. 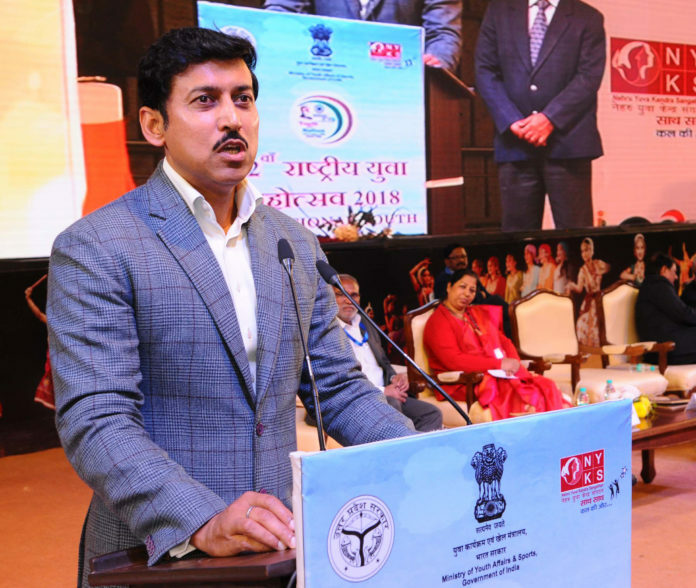 The Anthem was launched by, Minister of State ( I/C) for Youth Affairs and Sports Col. Rajyavardhan Rathore, along with the Mr. Sanjay Gupta, Managing Director, Star India in New Delhi on last Monday. The Khelo India Anthem was launched ahead of the Khelo India School Games, an initiative by the Ministry of Youth Affairs & Sports, Government of India, which encourages mass participation and excellence in sports among youngsters. A spirited composition, the Khelo India Anthem is now all set to go live on TV, OOH and other media as well. The anthem is conceptualized by Ogilvy, composed by Louis Bank and the film has been produced by Nirvana Films. #KheloIndia programme is now ready to host school games at various levels that will be broadcasted live by Star Sports. Every year, 1000 athletes will be selected through an under 17 tournaments and a portal. They will be rewarded with a scholarship of Rs. 5 Lakhs every year continuously for 8 years.